A brave customer thwarted a raid at a newsagent by an armed robber. The kitchen-knife wielding robber demanded cash from a shopkeeper and then stabbed him on Sunday. But the crook left empty-handed after the customer intervened at Everton News on City Road, Walton, Liverpool at about 20:00 GMT. Police said the shopkeeper's injuries were not life-threatening, and praised the "brave member of the public who intervened". 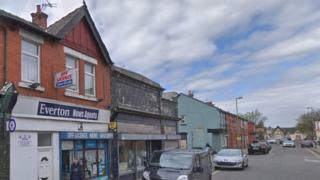 Det Insp Debbie Tipton said the customer had prevented "the shopkeeper from potentially suffering further injury".